Ring News 24Boxing NewsFight Report: Kotey’s “Nightmare” at the Hands of Decastro – Pugh and Hughes Reign Supreme at Pride Park. 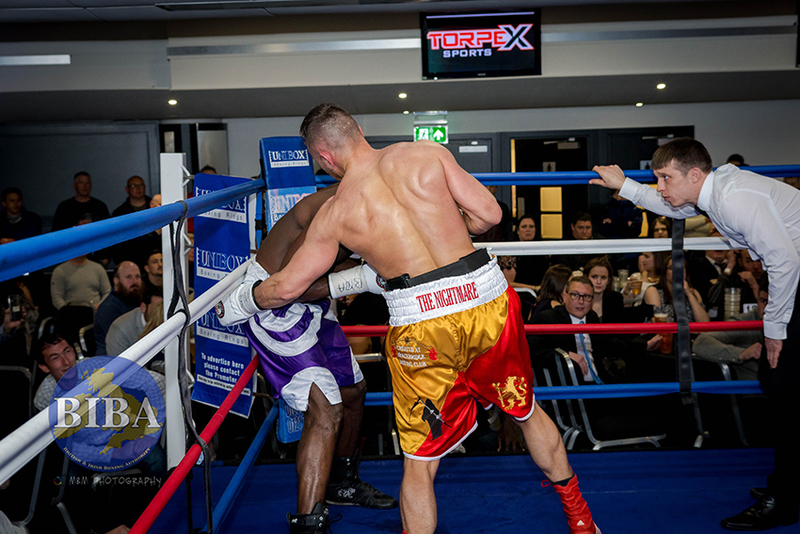 Fight Report: Kotey’s “Nightmare” at the Hands of Decastro – Pugh and Hughes Reign Supreme at Pride Park. Pride Park in Derby may be best known as home of Derby County FC, however after Saturday night it may be just as well known as the new home of Boxing in the City. Local Promoter Dan Gray and his team really pulled out all of the stops to put on a seriously top class International event, Dan Gray’s second at the stunning venue, that outclassed the vast majority of the biggest televised events in the country, not just in the realm of quality of the promotion but also with regard to matching. How refreshing it was to be ringside at an event where each and every fight was so evenly matched you really didn’t know who was going to emerge victorious. This was boxing the way it should be and I loved every second of it, as I am pretty sure so did every single person that attended, well as virtually everyone was on their feet vociferously showing their support for the fighters throughout each fight I can say that with some confidence. Anyway enough of my waffle, let’s get to the fights themselves, in reverse order. Local Prospect Ross Doherty headlined the show, against Latvia’s Grigorijs Dunecs in an eight round Welterweight contest. Dunecs is tall for a Welter, with a seriously long reach, which initially he was able to use to good effect to keep his shorter opponent Doherty at bay for about the first minute or so of the first round, Doherty though has a switched on boxing brain and soon adapted his tactics to get around this major disadvantage. Sensational and clever boxing from the local lad see him soon get a semblance of control of the bout in his favour, mainly targeting the body with single shots and getting out of range before Dunecs could counter with effect. More of the same in the early part second, however Doherty’s confidence soon grew to a level where he was able to slip under the impressive jab from the Latvian and let rip with sharp double-handed combinations, before slipping back out of range. Don’t get me wrong it wasn’t all one-way traffic, far from it as Dunecs had plenty of success landing his shots too, just Doherty’s clever movement and pure guts to get inside to land his were mightily impressive. More of the same in the next couple of rounds, really great, highly technical boxing from both protagonists, but the fifth proved to be a major turning point, as Doherty dug deep and switched tactics again, seemingly coming in for another body attack, but at the last microsecond switching to a looping shot to the head. Dunecs, soon got to grip with the new tactic and basically neutralized this highly effective move. Doherty though just dug deep into his well-stocked locker and produced another clever move. As the fight headed into the final couple of rounds the fans ringside were treated to some good old-fashioned close quarter slug outs. The final round was a cracker, well the whole fight was, but the final round encapsulated the flavour of the contest best, both fighters threw caution to the wind and really went for it – it was breath-taking to watch. After eight fantastic closely fought rounds of boxing Referee Rob Jones’ scorecard read 80-72 in favour of Ross Doherty, although absolutely the correct score, it just didn’t reflect just how close the vast majority of the rounds were. Preceding the excellent Doherty-Dunecs fight was a battle of two Pro debutants, Great Britain’s Emily Pugh versus Latvia’s Jelizaveta Cerkasova. What a fight, it was superb and I know before I even start writing I’m not going to be able to adequately describe just how good this fight was, but am going to give it my best shot. Right from the opening bell both girls moved forward and met in centre ring and exchanged good strong jabs and so began a highly technical chess match of a fight, where both protagonists displayed the excellent fight skills in their respective lockers in an attempt to out gun the other. For four sensational rounds Pugh and Cerkasova displayed their respective, skills much to the delight of all ringside. It was a master-class, but not in the normal sense of the word, how we use it in boxing, whereby one boxer gave a master-class to their opponent, I mean it was a true master-class of boxing full stop, it was enthralling to watch and as for officiating I would reckon Referee Rob Jones has never had a better fight to officiate, he could have come and sat ringside and watched, he had that little to do, other than take a watching brief. After four absolutely wonderful, exciting rounds of boxing Referee Rob Jones scored the bout 40-36 in favour of Emily Pugh, and as with the Doherty-Dunecs scoring it was a hundred per cent correct but again just doesn’t represent just how incredibly closely fought the contest was. Prior to my Fight of the Night winner, Pugh Vs. Cerkasova, was the hugely anticipated and way overdue Super Middleweight contest between Bardley, Lincolnshire’s very own unbeaten and IBF Ranked Super Star Nathan “The Nightmare” Decastro and Philip “Sweet Pea” Kotey. Twice previously this fight had been matched, but injury and illness prevented Kotey making it into the ring on fight night, was this going to be third time lucky, you can bet your bottom dollar on it and boy oh boy was it worth it, especially as on Saturday there was a title on the line, the Professional Boxing Council (PBC) International, to add spice to the proceedings. Right from the off Decastro powered to centre ring and let rip with a huge right, similar to the one he sent Chris Eubanks Jnr. to the canvas with when they faced each other in the amateurs, however in this case somehow Kotey managed to stay on his feet and proceeded to cover up, like a red flag to a bull that just beckoned Decastro to punish his opponent with huge lefts and rights. Decastro kept on throwing shots, forcing Kotey back onto the ropes and then the fireworks really began to fly. Kotey responds with wicked short hooks to the head followed by close quarters uppercuts, whilst Decastro just kept letting rip with big heavy handed hooks to head and body. For virtually the entire rest of the round this fight could have taken place in a phone box, but don’t go thinking that means little was happening as they were too close, oh no nothing like that it was all action, I lost count of the amount of shots both fighters threw, they were just raining down. More of the same in the second, although a couple of times Kotey had managed to free himself and utilize really good strong jabs, however Decastro just walked through them whilst throwing big lefts and rights to the body once more to coral the Ghanaian back onto the ropes or a corner. Right at the very end of the round Kotey let rip with a huge uppercut, Decastro just managed to slip back enough for it to go whizzing past his chin before letting rip with a huge right to the head literally as the bell to end the second round rang. Kotey stayed in the corner, clearly distressed, before collapsing to the canvas where he began writhing in pain, Referee Rob Jones immediately called the Doctor and Paramedics into the ring and waved the fight off. The massive uppercut was probably the cause for Kotey’s distress, which was later stated to be a torn rotor cuff injury. The tough Ghanaian decided he still was going to be present for the Championship Belt presentation to Decastro, even though still in extreme pain, proceeded to stand astride the referee as the result was announced and even took the time to congratulate Decastro for his victory before going back to the medical room for further treatment. The opening professional fight of the night was a battle of the Celts, with Derby based Scotsman Kane Corvus making his debut against Welshman Steffan Hughes in a four round Cruiserweight contest. The fight started a frenetic pace, Corvus bouncing in, letting rip, before bouncing back out again, after about twenty seconds or so Promoter Dan Gray shouted out to Corvus “slow down, plant your feet”, the big Scotsman immediately complied and proceeded to take a much more controlled approach to the business in hand, so much so that he secured the round in style. Round two see Corvus boxing nicely off the front foot, but also see Hughes come more into the fight. There were some cracking exchanges, one such about three quarters in, see Corvus land a big left and as he leant back to where he thought he’d be out of range, Hughes took a slight step forward and landed a very good straight right which sent the Scotsman to the canvas. Corvus was straight up on his feet and once Referee Rob Jones had finished the count and instructed them to box on, Corvus moved forward and landed another good strong shot, only for Hughes to counter equally effectively just as the bell to end the round tolled. Corvus now seemed to be more settled and boxed effectively, Hughes seemed to be content to absorb the shots and counter occasionally. As the round progressed there were some really nice exchanges, then out of the blue Hughes threw a peach of a shot to Corvus’ body, which sent the big Scotsman to the canvas for a second time. Again Corvus made the count and also made a big impression late in the round when he landed a cracking body shot, which slowed Hughes but didn’t send him down. Going into the fourth and final round Corvus was told by his corner that at best to get a draw he would need to drop Hughes and sure as eggs is eggs, he proceeded to try his hardest throughout the round to do just that, however Hughes is as savvy as they come and just got behind his jab to keep the marauding Scot at bay. After four rounds of entertaining boxing Referee Rob Jones scored the contest 38-37 in favour of Steffan Hughes. Supporting the four pro contests were no less than eight unsanctioned fights, the highlight of these was the contest featuring Megan Mousley, against seriously tough Cheryl Swarbrick. Mousley, who fought with class and panache came through with flying colours. After this bout Promoter Dan Gray announced that this was Mousley’s final fight, on the unsanctioned amateur circuit, as she is turning professional and will make her pro debut on Dan’s next show in August. Without doubt she will make a very welcome addition to the pro ranks.